Infralogix offers several advantages for our customers over alternate service providers. The unique combination of our system-level improvement services, equipment-focused predictive services and our broad industry experience across diverse markets offers unprecedented value to our customers. Whether your organization seeks improvement in your CMMS system or your overall maintenance program, few companies can help with services to address the assessment, design and implementation of those improvements. Infralogix offers services for these system-level needs, plus the ability to help with implementation and execution of your efforts. Additionally, it’s rare to find a reliability services company that has gained such proficiency in more than one predictive technology. Infralogix commands a unique position with expertise in multiple predictive technologies. This versatility allows Infralogix to offer the best-solution for the job, not just the ones we specialize in. We are also able to combine services for an integrated solution, customizing solutions that provide greater opportunities to improve reliability for our customers. Infralogix has not only compiled a unique combination of services, but we’ve provided these services to a wide variety of businesses in diverse markets. Consequently, we’ve gained extensive experience and insights that we’re able to translate into added-value for each customer. As we apply lessons learned from one industry to another, we strengthen our expertise to guide reliability improvement across common equipment types. 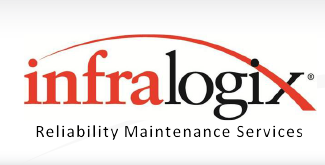 Another advantage, Infralogix is an independent reliability services provider. This status allows us to maintain the role of a completely objective auditor that only serves the best interest of our customers. We don’t sell repair services, OEM equipment, CMMS software or P& C insurance. Therefore, we aren’t subject to inherent conflicts of interests or other biases that may affect the accuracy, completeness or thoroughness of our findings.